Converting your Ford campervan is a specialty of Westcountry Conversions with a wide range of conversion jobs completed to date. The Ford Transit Custom has available on the Uk market since 2013 with a variety of engine sizes and features. Here at Westcountry Conversions, we can convert any Transit Custom in to a quality camper van with a varied number of features including FULLY CRASH TESTED folding seat beds, mains hookup, cooking facilites and REIMO elevated roofs to name but a few. Please contact us to discuss your requirements. 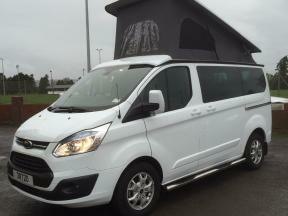 Ford Transit Custom Campervan Conversion with RIB seat bed and Reimo elevating roof. - Colour coded Reimo Elevating Roof with fully tested strengthening frame. - 4 berth achieved with Reimo elevating roof bed. - RIB Double rear seat/bed (Fully crash tested with seat belts). - Fully lined & insulated, 18mm ply floor with Altro flooring, Privacy or clear windows all round. - Custom built full side units produced on site from specialist light weight ply including fold away table. - Pull out tray storage. - Waeco CRX50 compressor fridge with digital controls and removable ice shelf. - Dometic SMEV 9222 combination cooker and sink unit. - Individually switched 12V LED lighting on both sides of the van. - KURS fully adjustable, individually switched LED reading lights in all 4 corners. - 2 in board 12ltr water tank with 12v submersible pump electrically controlled by Florenz fold down tap. - Full mains and 230v power management system, mains hook up and 2 double CBE 230v sockets. - CBE 12v auxiliary socket with optional upgrade to USB. - Leisure battery with intelligent charging system while driving. - Front cab matt included with every T6 conversion. - Custom built stainless steel gas box and regulator designed to house 2.75kg Camping Gaz canister. - Van X black out curtains on all rear windows. - Full gas safety test and certification carried out by an independent ‘Gas Safe’ Engineer.